Many words have been used to describe former Alaska Governor Sarah Palin, but maybe the most appropriate is gracious. Palin, along with husband Todd and daughters Willow and Piper, attend Bruce Rastetter’s annual summer party on Saturday night at his rural north-central Iowa home. Rastetter’s summer party is an annual event that draws hundreds of his friends, business associates, and plenty of Republican elected officials. Last year, three different presidential candidates mingled with guests. This year besides Palin, Governor Branstad, Senator Grassley, and Congressman King and Latham were all in attendance. In a Fox News interview this week Palin said that she would be visiting Iowa, Missouri, and Nebraska. While Palin didn’t do any campaigning in Iowa, she did campaign for U.S. Senate candidate Sarah Steelman in Missouri and made a stop in Nebraska in support of U.S. Senate candidate Deb Fischer. 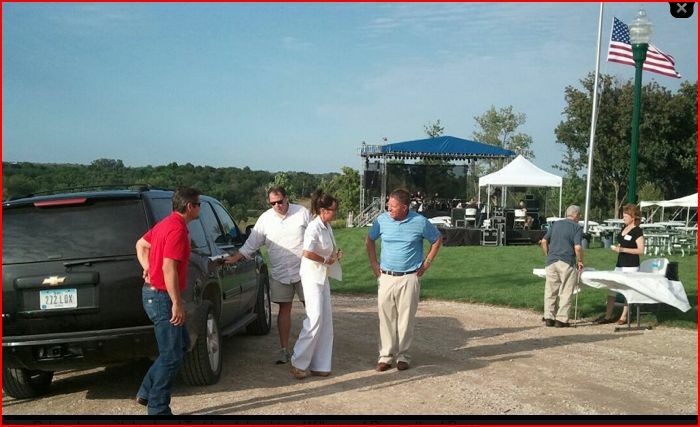 Sarah Palin is in Iowa tonight, attending agribusiness leader Bruce Rastetter’s summer party at his home in Hubbard in north-central Iowa. The invitation for the event promises music, the presentation of a philanthropy award and “special guests” but doesn’t mention Palin, the darling of many conservatives, especially in the tea party, after her 2008 vice presidential run and subsequent media and political stardom.